FAO-IPC is the only scientific Committee that is not only concentrating on fundamental research of poplar and willow, but also on the practical aspect of poplar culture. This is very important because poplar and willow plantations are becoming more and more important again all over the world, mainly because of the use of the wood for bio-energy. At the same time, change of climatic conditions might have a great influence on the spread and appearance of poplar and willow diseases in the near future. In addition, international transfer of plant material (cuttings, sets) will enhance the (unwanted) spread of pathogens. Because of intensive use of poplar and willow in bioenergy plantations, more and more research will be needed on diseases. Therefore, we believe that international collaboration in the field of poplar and willow diseases will be needed more than ever, and there will be important with a Working Party with a strong profile on diseases to reach and attract the right stakeholders. Discussion has been initiated on merging or cooperation between the WP for Diseases and the WP for Insects and Pests and both WP’s agree that we should continue to have separate WP’s, at least for the coming 4 years. The close relations between the topics, however, would benefit from closer cooperation when it comes to exchange of information concerning ongoing projects and active researchers. We also agreed on planning for a joint meeting within two years. The activity within the WP has been low during the period, mainly because of low number of people attached. For the Executives it has been a period of reorganization and preoccupation in the business of own departments and research projects. With a new situation to be expected during next year the activities of the WP have all opportunities to develop and be revitalized. The most notable and successful activity is the close cooperation of the WP for Diseases with the WP Environmental Applications and Production systems (output H). We have agreed to try to have joint meetings or to attend each others WP workshops. A joint meeting was arranged in Sweden and Estonia with WP Environmental Applications, Production Systems and Diseases in May 2005 with participants from both WP. Participants from WP Diseases also took part in the Environmental Applications Working Party meeting in Belfast, 2006 and in Montreal, June 2007, with oral presentations. During the last year, the Research Institute for Nature and Forest - DGBS in Geraardsbergen, Belgium, has been approached by several private companies all over Europe to get more information and also plant material from our newly selected poplar cultivars. We believe, more and more information will be needed by the poplar industry in the near future. IPC is the best organisation for distributing both scientific and practical information on poplars and willows, including diseases. For this, the webpage for the WP must be updated and made user-friendly and easy to access – to be a portal for information and news concerning diseases. The information includes listing of active researchers in the field, an updated list of publications and ongoing projects. In the frame of a EU project Treebreedex, in September 2009, the Research Institute for Nature and Forest has also organised a workshop on screening and selection methods within forest tree breeding programmes. One of the topics has been development and demonstration of screening methods for disease resistance. We investigated the possibilities to hold a WP meeting at the same time, in order to give the WP participants the possibility to join the Treebreedex workshop in this important matter. The next Executive Committee meeting will be held 2010, in September, when IPS will organize a meeting in Orvieto, Italy. This will be an excellent opportunity for the WP for Diseases to organize a WP workshop in close proximity to get better contact with IPS participants and attract new members. The matter has also been discussed with WP for Pest and Insects to jointly plan this workshop. Ideas are initiated on a new international collaboration project on Melampsora rust, based on observation of a network of poplar and willow field trials with a well-defined selection of genotypes, spread all over Europe. Contacts have already been taken between the Research Institute for Nature and Forest in Belgium and several East-European countries that might be interested in participation. 1. Meeting for the WP during August 2010, possibly together with WP Insects and/or WP6 in connection with the IPS meeting. Planning during 2009 for a first call before summer. 2. Meeting /workshop in the frame of the EU-project Treebreedex in September 2009 in Belgium, on development of screening methods for disease resistance. 3. Update the membership list of active researchers on Poplar and Willow diseases and add to the Directory of Poplar and Willow Specialists and the IPC website. To be executed before July 2009. 4. Routinely post an annotated bibliography of Poplar and Willow disease publications and upload these to the IPC website. A first version of publications during the last 4 years to be uploaded before July 2009. 5. Prepare a database of Poplar and Willow disease projects and their relevant web links. After p.3-4 are executed a questionnaire can be sent out to all researchers addressed by the topic, asking for ongoing projects in different countries; to be uploaded on the web page. They will also be asked to visit the IPC-WP website for possible additions or changes of the listings in p. 3-4. 6. Take initiatives to coordinate a common international collaboration project on Melampsora rust. Questionnaire for interest sent out early 2009. 7. Coordinate the chapter on diseases of the Poplar and Willow book to be finished before March 2009. 8. Prepare a NEWSROOM, during 2009, with short notes on Poplar and Willow diseases and encourage contributors to add new information and ideas. An informal forum for fast information. 9. Create a new network such as Forpath to be accessible through the IPC website. 10. Establish a chat room to consult pathologists on identification and discuss issues related to diseases. Requires people with competence in specific topics that agree to follow this, or somebody responsible for the chat room that will forward the tasks to the person of choice. Both p.9 and p.10 are ideas partly overlapping each other and p.8. Further discussion is required to find what to give priority and what the needs are. 11. Strengthen linkages with other Working Parties: Common meetings with WP6, cooperation with WP insects and Pests, meetings in connection to IPS and IUFRO sessions. During the 22nd Session of the IPC, the Working Party held one technical meeting during which four scientific/technical papers were presented and discussed and several posters of Poplar and Willow disease threats and impacts were displayed and discussed in the poster sessions. The Working Party aimed to act as a focal point for those seeking information on identifying and managing pathogens on Poplars and Willows. The focus was to disseminate information on diseases and networking with researchers and other users on their management. Specifically close linkages with breeders would be necessary on new pathogens to prepare selection strategies to be adopted in their breeding programmes. Additionally, the Working Party would provide guidance for the import/export of plant genetic material and quarantine. The list of active researchers working on Poplar and Willow diseases was updated. Low profile of the Working Party. Use of list servers to increase the profile of the Working Party. Declining participation in NPCs in North America. There are advantages of being proactive rather than reactive - prevention through preparedness and prediction. Posting of recent publications and, annotated bibliographies of the IPC website. Strengthen linkages with other Working Parties. Inform Governments and National Poplar Commissions about the increasing requirements for research on disease problems caused by plant-associated bacteria in correlation with specific environmental conditions. This working party has met regularly since its first meeting in Paris in April 1957, with attendance mainly by pathologists. Each meeting has served to exchange information about the health conditions of poplar and willow plantations in the member countries and about the work done and the results of research. An overview paper describing the activities of the working party since its formation was presented by the chairperson in 1992. Marsonnina brunnea on poplar leaf (Photo: E.N.C.C. )At each meeting, a subject is proposed to the participants so that discussion can quickly concentrate on a common field. Joint research programmes have been agreed between pathology laboratories where mention may be made of international arrangements for studying the susceptibility of cultivars to Marssonina brunnea and a research programme on sensitivity to Xanthomonas populi. In carrying out these programmes, pathologists have helped one another, exchanging information, techniques and sometimes their material. They have received visiting researchers who can then familiarize themselves with the methods applied. In this way knowledge of poplar and willow diseases has made rapid strides towards their control. Apart from summary reports of the meetings, with the texts of the communications presented in an annex providing a wealth of documentation, the working party in 1981 completed a synthesis which was published under the title Les maladies du peuplier (Poplar diseases) by the National Forestry Fund set up in 1946 by France. 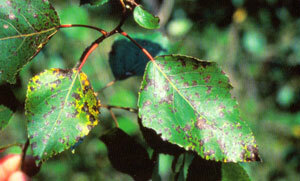 The leaf diseases, for example, Marssonina brunnea and, in particular, the rust diseases Melampsora spp. 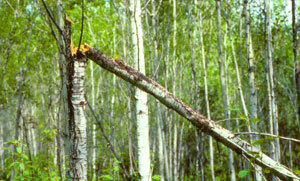 have been a major cause of loss of vigour in poplar plantations in many countries. Because of the high variability of the diseases, work has initially concentrated on their taxonomy. The sensitivity of 78 clones of European origin to Marssonina brunnea has been tested in France. As there was a certain divergence among the findings obtained in a number of countries, the working party has been endeavouring to find satisfactory explanations through international cooperation. 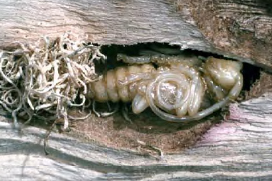 The bark parasite Dothichiza populea, which is also highly variable, has caused increasing concern to affected countries. The gravity of risk from virus diseases was recently highlighted by the working party. Though damage attributed to air pollution may be caused primarily by physiological stress, a suggestion was made at one of the last meetings of the working party that it should become involved with this topic. The working party has repeatedly drawn attention to the existence of physiological races of Melampsora larici-populina and M. allii-populina and to the rapid evolution of populations of these races. Although it was acknowledged that progress has been made in understanding the reaction of clones and species of poplar to the diseases, it has been stressed that more attention should be paid to the selection of clones for resistance to both pathogens. A strategy has been described for the breeding of white poplar, involving the selection of families and provenances for tolerance to frost and drought. Two joint projects were prepared in 1994 with the Working Party on Poplar and Willow Insect Pests. The first aimed to acquire systematic knowledge on the natural resistance mechanisms of poplars and willows towards insects and diseases. The second looked for possible correlations between tree susceptibility and soil characteristics or other ecological factors, in order to determine the risk of damage by insects or diseases to a particular poplar or willow for a given site. the preparation of a detailed study of the diversity of two pathogens Marssonina brunnea and Discoporium populeum. Once again potential problems arising from the transfer of diseases from one continent to another were identified as being of high importance. In 1999, a global Review of Fungal Diseases in Poplar was prepared by G. Cellerino. Updating the membership list of active researchers in the pathology and entomology of Populus and Salix. It would be maintained on IPC web site and in the IPC Directory of Poplar and Willow Researchers. Researchers in this area will be asked to submit not only their contact information, but also a list of their current projects, and relevant links. The working party will attempt to meet in conjunction with the IUFRO rust group between IPC meetings. Active researchers will be asked to contribute to IPC web pages on 'Methods in the Pathology and Entomology of the Salicaceae' and ' WP News'. (d) development of early-screening methods for under-researched pathogens such as Discosporium. The IPC should encourage member nations to increase funding for research and training of new scientists. The establishment of international fellowships and scholarships would be particularly beneficial. Detailed studies of worldwide pathogen populations, pathogen variation and host range were needed (see the reference to the global study of diseases of poplars, above). To this end, living collections of insects and pathogens of the Salicaceae were required, and since establishment and maintenance of such collections are expensive, possibly funded by the IPC. The IPC should make available on its Web site, the proceedings of IPC meetings and full-text versions of archived, published material that is currently unavailable electronically. Some insects and other animals pose a demonstrable threat to the world forests, including an increasingly one to both endemic and exotic Poplars and Willows. The Working Party can assist in increasing awareness and reducing the incidence and impacts of invasive insects and other animal pests for Poplar and Willow production and products trade. The aim of the Working Party is to provide international connectivity (networks, websites, publications, lists of experts, etc.) between researchers on, and producers of, Poplars and Willows through National Poplar Commissions, the International Poplar Commission and other relevant institutions (International Poplar Symposium, IUFRO). Identify and integrate common projects within or between Working Parties. Conduct a joint meeting with the Working Party on Poplar and Willow Diseases, to coincide with the IUFRO International Poplar Symposium, Orvieto, Italy, September 2010. During the 22nd Session of the IPC, the Working Party held two technical meetings during which eight scientific/technical papers on a range of insect pest threats and impacts were presented and discussed and several posters on these topics displayed and discussed in the poster sessions. Networking between researchers and producers. Limited duration of research contracts. Bi-annual 'newsletter' of activities of the working party. Need for collaboration with entomologists around the world. Identify and integrate common projects (within and between working parties). Upload all outputs to the Working Party portal on the IPC website. Identify priority problems and collaborative approaches to address them through multi-disciplinary approaches across different Working Parties. This working party was created in 1957 after a number of Belgian, Dutch, French, Italian, and Spanish entomologists met in Paris. They pointed out the potentially harmful significance of insects, mainly xylophagous, to the development of modern poplar and willow cultivation and suggested that IPC set up a working party on pests, along the lines of the Working Party on Poplar and Willow Diseases. Since its establishment, the working party has met in the same spirit and with the same goals as those of the working party on diseases. It has not confined its work to insects but to other animal pests as well. The amalgamation of the two working parties on insects and diseases has been discussed, most recently in 2000, but was not accepted by the members of the former. It was felt that the scientific disciplines of entomology and plant pathology were sufficiently different to justify the separate existence of the two working parties. However, all participants agreed that close collaboration between the two working parties, and with the Working Party on Willow Genetics, Conservation and Improvement, was valuable and should continue. Joint sessions of working parties were seen to be a good way of showing how collaboration worked in practice. Cryptorhynchus lapathi, adult (Photo: FAO) Saperda carcharias (Photo: E.N.C.C. 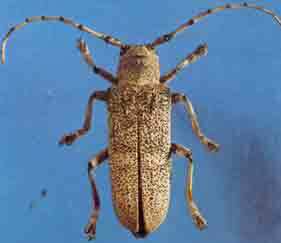 )Except for the presence of a new pest recorded from France (Anisandrus dispar) and the problems arising from associations between poplars and agricultural crops, there has been no serious attack by new insect pests for several years. 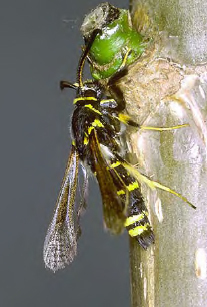 In Europe, the most harmful insects continue to be primarily borers such as Cryptorrynchus lapathi, Saperda carcharias, and Paranthrene tabaniformis. 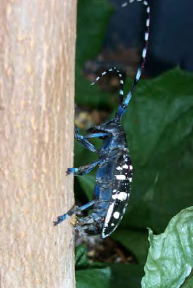 In Argentina, considerable damage is being attributed to the defoliating insects Nematus desantisi and Hylesia nigricans, a sucker (Pterocomma populea), and a borer (Platypus sulcatus); rodent damage to young plantations has also been reported. Anoplophora glabripennis (Photo: FAO)Three polyphagous borers: the Asian long-horned beetle, Anoplophora glabripennis (imported from USA), Apriona germari and Batocera horsfieldi, and two oligophagous: Saperda populnea and Cryptorhynchus lapathi are responsible for important poplar mortality in different provinces of China. Defoliators such as the Lepidoptera - Clostera anachoreta, Apocheima cinerarius and Lymantria - a re also important pests hosted by poplar species in China. The working party has foreseen that the trend in phytosanitary protection of poplars and willows will be noticeable for the increased use of biological control methods (for instance, preparations based on Bacillus thuringiensis have been increasingly used for the control of Lepidoptera, and the control of Cryptorrynchus lapathi by nematodes), the breeding of pest resistant clones, and the increased use of environmentally less harmful insecticides (such as those containing diflubenzuron). Anoplophora glabripennis, pupa (Photo: FAO)Whether the enlargement of the genetic base of the planting material and the reduction of the risk factor could be better achieved by planting clones in mixtures or through a mosaic of monoclonal plantations has been debated by the working party, which has also drawn attention to the need to increase basic research on resistance of the Salicaceae to pest damage. It has recommended that interdisciplinary work aimed at genetic improvement should be increased as well. The choice of clones to be planted in a given environment has to be based not only on short-term economic considerations of fast growth but also on the need to satisfy other requirements, such as the maintenance of genetic diversity. By so doing, better protection will be offered against biotic or abiotic risks and better adaptation to local variability of the site. the encouragement of young scientists through a system of fellowships. support to education of young scientists by the European Community and other donors. 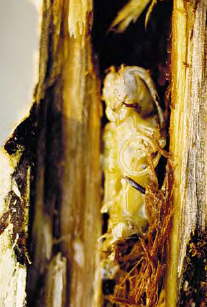 An overview of internationally important insect pest of poplars was prepared in 1999 by L. Nef. It was based on the results of an enquiry conducted among member countries in 1993. The document is at present (February 2002) being expanded to cover insect pests of both poplars and willows and will be published in both electronic format and hard copy. It will be illustrated by photographs of major insect pests to aid recognition and will include control recommendations, including advice on the safe use of pesticides. Provision will be made for periodic updating by members of the working party. The recommendations made at the twentieth session in Budapest were re-affirmed which dealt with the improvement of methodology for pest control, the safe exchange of germplasm among countries, and the exchange of experiences among scientists. The need was stressed for continued collaboration and cooperation among members of the working party and other entomologists working on poplar and willow insects, and the promotion of all aspects of the study of insects living in poplar and willow environments. 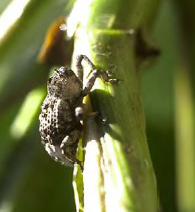 Research should continue to focus on all aspects of insect pests of poplars and willows, including breeding for pest resistance. It will also include the appropriate research interests in broader areas of the environmental and conservation, and international 'biosecurity'. At future IPC meetings, joint sessions between the insects and diseases working parties and the breeding working party should continue to be held where appropriate. More time should be allowed for scientific presentations. Activities for the next four years should include updating the electronic publication on the damaging insects of poplars (see above) to include international data; expansion of the publication to include Salix insects; and the establishment of a page on poplar and willow insects on the IPC Web site.